The Tallest Mountain In The United States Is? Best Known For Lightbulbs, Phonographs, And Film, Thomas Edison Also Invented? If you’re looking for a tall mountain to scale and you’d like to do it on American soil, you’d be well served to head to Alaska. While people might think of the Rocky Mountains when they think of mountainous terrain in the United States, they should really turn their gaze north to Alaska. 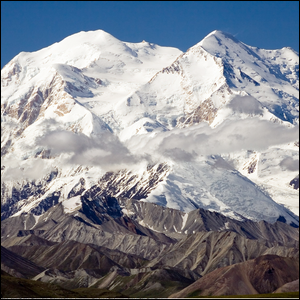 Alaska is home to all ten of the ten tallest mountains in the United States including: the tallest mountain in the U.S., tallest in North America, and third tallest in the world: Mount McKinley. In fact, depending on how you measure things, you can even argue that Mount McKinley is the tallest mountain in the world in terms of base-to-peak elevation (and not total feet above sea level). Mount Everest is regarded as the tallest mountain in the world in total elevation, but that’s because it gets a big boost from the Tibetan Plateau it sits on. Mount McKinley, on the other hand, has a base that starts with a sloping plain between 980 and 2,950 feet above sea level, but the peak rises to 20,237 feet. The total rise then is ~18,000 feet from base-to-peak whereas with Everest when you subtract out the boost provided by the already elevated Tibetan Plateau, you find the rise from base-to-peak is only 11,980 to 15,260 feet (depending on whether you are on the north or south side). If you’re looking for a little more mountain trivia before we leave snowy Alaska, let’s turn our attention to the mountain’s name (of which it has had several). Mount McKinley sits in Denali National Park and Preserve. Denali (also Dinale) was the original name in the native language for the mountain. The Koyukon Athabaskan people named the mountain Denali, which means “the high one or the great one”. When Alaska was under Russian control, the Russians called it “Bolshaya Gora” which was merely a literal translation of the native population’s name: it means big mountain in Russian. Later in the 1880s, the mountain was briefly called Densmore’s Mountain after an Alaskan prospector who was the first European to reach the base of it. In 1896, a gold prospector named the mountain Mount McKinley in political support of the then-presidential candidate William McKinley and a little over twenty years later in 1917, the name was made official under President Wilson with the Mount McKinley National Park Act. Curiously, when the Alaskans attempted to change the official name of the mountain back to Denali out of respect for the local culture and the mountain’s original name, the efforts were blocked by an Ohio congressman whose district included President McKinley’s home town. Image courtesy of Nic McPhee.